Irish/UK oil company San Leon Energy's work in occupied Western Sahara is delayed, and the company claims to the Moroccan government that it is due to "regional security situation". San Leon Energy has for a decade held interest in a controversial licence called "Zag Licence" partially located in Morocco and in occupied Western Sahara. On 19 April, San Leon stated in a release that it is trying to avoid a penalty for not having progressed its works according to plans. The company states that "the regional security situation" justifies a case of force majeure. San Leon's partner on the block PetroMaroc also issued a statement on the issue on 19 April, but without addressing security. PetroMaroc's statement is somewhat vaguer. Massive numbers of Saharawi refugees gathered last weekend to send a clear message to Irish oil company San Leon Energy which is looking for oil in their occupied homeland: "San Leon: go home". Find high resolution footage of the protest, free of charge. "The Company has notified ONHYM that a "force majeure" has occurred pursuant to the Petroleum Agreement due to financial, commercial and operational challenges on the licence over a number of years", PetroMaroc stated. Ironically, the two companies could be more concerned about the legal risks in operating in the territory without the consent of the people of Western Sahara. 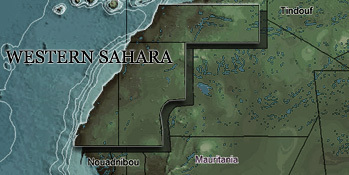 Morocco has been occupying Western Sahara since 1975. The Court of Justice of the EU on 21 December 2016 judged it illegal for the EU to enter into agreements covering Western Sahara without seeking the consent of the people. San Leon, on the other side, feels the Saharawi people are irrelevant to seek consent from. "They’re not…from our point of view, and certainly from the point of view of the organisation and the government that issues our licence, they are not a representative people", Daniel Martin, lawyer of San Leon Energy, told Irish national TV, 4 August 2011. In 2016, the UN Secretary General stated that Morocco's unilateral deportation of UN personnel from the territory constituted a security risk, as it would no longer be able to comply with its mandate. The French government succeeded in avoiding a US call for immediate return of the UN staff. A separate San Leon release on 19 April gives also an update on the concrete discussions of the company take-over by Chinese interests. WSRW wrote about this on 4 January 2017. Thousands of Saharawis have marched against San Leon Energy's drilling in the territory. San Leon carried out drilling on another block, Tarfaya, in 2015. This was the first ever drilling in Western Sahara onshore since Morocco illegally occupied it in 1975. WSRW in November 2016 wrote that it is not clear what role San Leon has on the Tarfaya block today.